Cost to install an electric vehicle charging station at home varies greatly by region (and even by zip code). Get free estimates from electricians in your city. Cost to install an electric vehicle charging station at home varies greatly by region (and even by zip code). Get free estimates from electricians in your city. 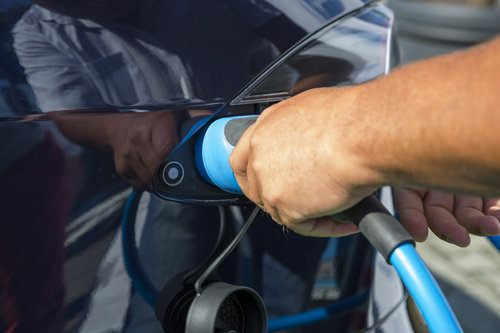 The average cost of installing an electric vehicle charging station is $1,200​. How much does it cost to install an electric vehicle charging station at home? As electric vehicles become more and more common, we will likely see growth in home electric vehicle charging stations. For this example, we'll examine the cost of installing a standard 240V charging station, which typically costs $1100-$1200. Although DIY-ers can install their own EV charging station, hiring a professional is the safer and recommended choice. Labor: expect to pay an electrician or contractor about $500 total for the entire installation process, with an hourly fee of $65-$85 per hour. Materials: there is a wide variety of EV charging station options available at all price points, but the average station costs $600-$700. Higher power chargers or those with longer cables will be towards the higher end of the price spectrum. A pedestal kit for easier access from the charger to the car can be added for around $700. WiFi-enabled charging stations can be a few hundred dollars more expensive, but they connect with a smartphone so you can monitor your car power levels and charging progress. Newer homes typically have 200 amp electrical service, which means you may need a utility upgrade to support a 100 amp wall connector. This can add another $150-$350 to your total cost. There are two types of EV chargers: Level 1 and Level 2. Your car manufacturer should provide you with a Level 1 charging cable when you buy the car; this cord simply plugs into a standard grounded wall outlet. Level 2 chargers require a dedicated circuit, which means an electrician may need to assess your home. Before starting the process, see if a Level 1 charger will be sufficient for your needs. Check with your contractor or electrician to see if a permit is needed. In most cases, you'll need a permit if you are upgrading and wiring electrical power, but the details vary by region. If the area you are installing the charging station isn't wired, you'll need to hire an electrician to spread the wiring, which can add another $6-$8 per linear foot of wire. How much does it cost to install an electric vehicle charging station at home in my city? Cost to install an electric vehicle charging station at home varies greatly by region (and even by zip code). To get free estimates from local contractors, please indicate yours. We have added an image of the project, and a summary at the beginning with the cost of installation to help the user better understand the project, and an index to take you directly to any part of the guide.